If you’re looking for the motorcycle of your dreams, whether it is a modern or classic model, there are plenty to choose from in the UK. For some riders however, there isn’t enough choice and personally importing can be the route to getting the model they want. This can be for a variety of reasons – sometimes it’s because certain models were never made available in the UK, sometimes because they are now too rare here or simply because it makes economic sense. In this guide, we take you through ten key steps for importing a used motorcycle (the rules differ slightly if you are importing a new model or if you are relocating to the UK and bringing a motorcycle with you). It can seem quite daunting at first but if you have the necessary patience and don’t mind a bit of research and paperwork, then importing could expand your horizons, in more ways than one! If you have a particular motorcycle in mind, you’ll quickly determine which country offers the best choice and the best prices. Some markets, the USA for example, are much bigger than the UK and an added bonus is that motorcycles there have often been used and/or stored in a far better conditions than the UK and typically have lower mileages. There are companies that regularly import bikes from other markets and sometimes they can source specific bikes for customers so it’s worth doing careful research on prices and options at this stage to make sure you get the best deal. When buying, get as much information as you can before parting with your money and always remember that motorcycles often look much better in pictures than they do in real life! Also, check that there are no obvious safety reasons for not importing the bike. Be sure to calculate the all-up price to take into account the exchange rate and different duties and taxes that may apply and make sure that the seller has evidence of title (i.e. it is theirs to sell) and ideally a registration document in their name. While it is possible to manage the whole process yourself, the time, money and stress saving benefits of using an experienced specialist shipping/import agent cannot be overstated. The really good news is that there a number of companies offering this service (see links below). Some will manage all aspects of the shipping including collection from the seller right up to delivery to your door or you can choose to make some of the arrangements yourself. As before, do your research to find the right agent that can deliver your motorcycle how and when you want it. Typical transit time for a motorcycle from the USA would be between 4 to 8 weeks. As a rule, seafreight is normally cheaper than airfreight (i.e. the quicker you want it, the more it will cost). It is recommended that you ask your carrier or agent to arrange insurance on a door to door basis, so if it gets damaged anywhere en-route it’s covered. Do not confuse this with normal carriers insurance as this will only cover the goods up to the limit of the carrier’s liability – typically in the region of £85.00 a ton so if your bike weighs in at 500 Kgs, and they lose it, you’ll probably only get £42.50 back! There are various shipping methods. 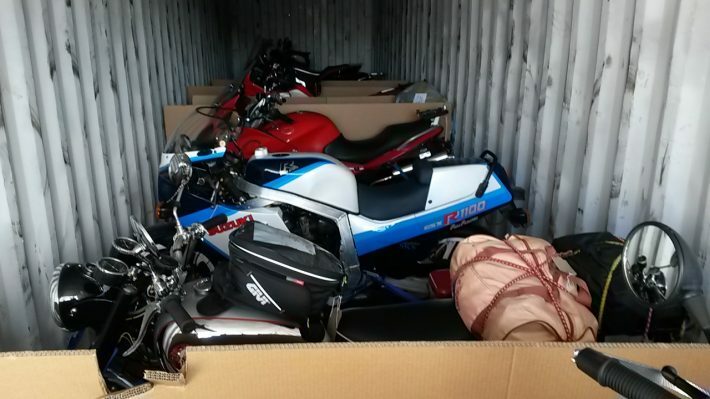 One option is to use a consolidated container dedicated to motorcycles where your motorcycle may be secured directly into the container or strapped down onto a flat pallet before loading alongside other motorcycles. To minimise the risk of damage, it’s advisable to check with the agent that they will not be sub-contracting the carriage to another agent who may be loading the container with other goods as well. 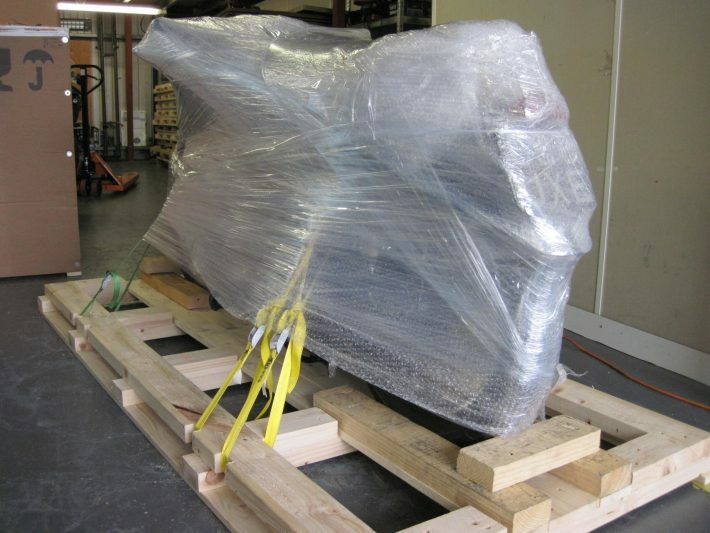 Another option is to ship the motorcycle in a shared cargo container in which case it is best to be fully crated (i.e. enclosed). Your chosen agent will be able to advise on crating requirements and specifications and most can organise this for you but it doesn’t come cheap. 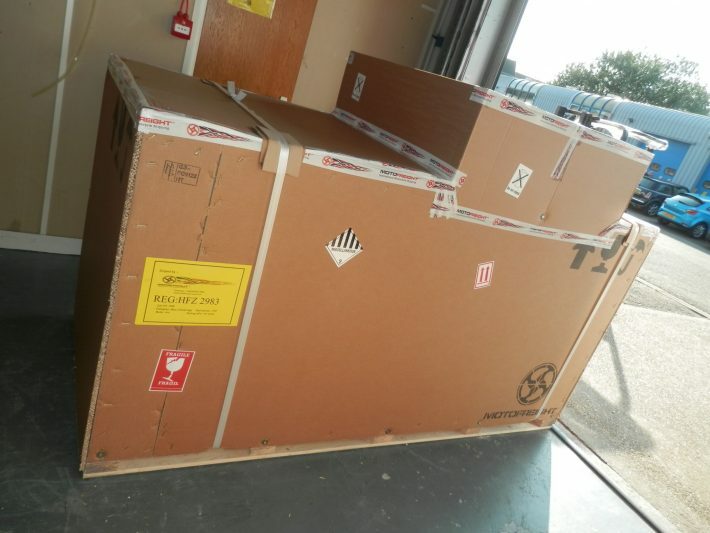 Therefore, if you can get the seller to crate the bike, this is likely to save you a sizeable sum but you must make sure that the seller and collection company are capable of loading the crate onto the collection vehicle. Franchised dealers in the country where you are buying the motorcycle can often be a good source for a used crate. One thing to remember is that in some countries like the USA, wooden crates can only be used if the timber is of a certain approved specification – yes, really! Whatever method you choose, petrol tanks and fluids will normally need to be drained (except perhaps for just very small amounts) and batteries disconnected and/or removed before crating. You will also need to measure and weigh the finished crate as this information will be required by your shipping agent. The main things you’ll need for shipping are (a) collection and delivery addresses; (b) Description of contents (i.e. a packing list which is especially important if your motorcycle has spares with it); (c) a bill of sale (invoice showing seller and buyer details, price paid, engine and frame numbers/VIN, description, etc.) and (d) the motorcycle logbook/registration document (basically, evidence of title). It is good to get a head start on ordering the necessary UK paperwork while your motorcycle is en-route so that you’re all set when your shipment arrives and also because there are some deadlines you’ll need to meet. 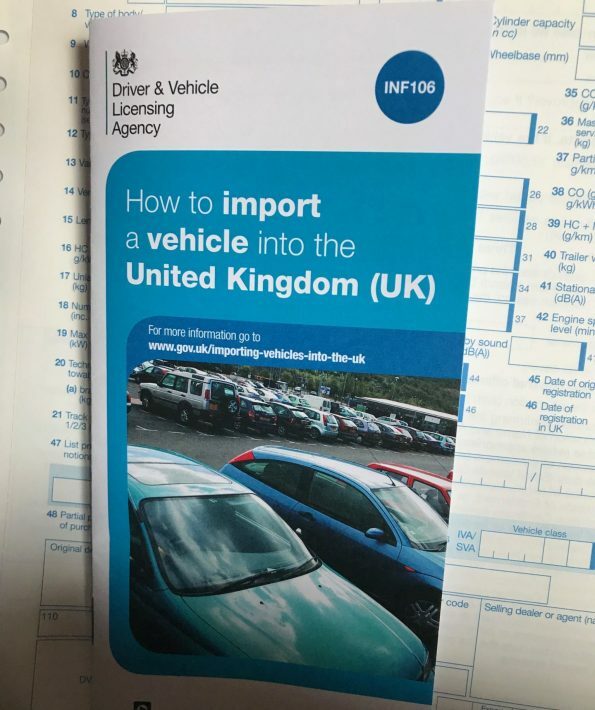 The gov.uk website (see links below) has some good information on what you need to do when importing a motorcycle and within this you’ll see that the DVLA makes available various packs to help personal importers. The one to order is the ‘used vehicle import pack’. 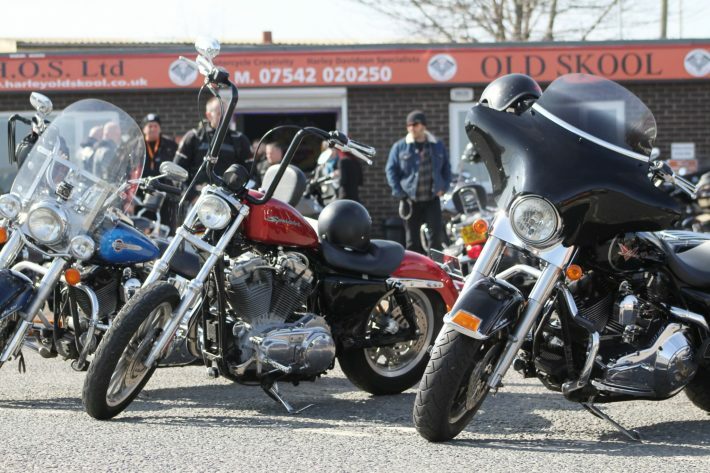 Be aware though that if your bike is over 30 years old and you are using an agent that will be paying the duty and VAT on your behalf (see section 7), you should check to make sure they pay the appropriate reduced rates for a ‘classic’. To do this, they may need to apply in advance to HMRC for what is known as a Binding Tariff Agreement. Your agent should know all about this. If you are arranging customs clearance yourself and not relying on an agent, you will need a copy of the transport document, bill of lading or Air Waybill, a copy of the commercial invoice or a statement of value and the packing list. The golden rule is to keep it simple – you should try and avoid HMRC examining the goods as they will charge for this. One thing that risks HMRC intervention is an importer that is seeking to reduce import duty and VAT by grossly undervaluing the bike, often by getting a ‘favourable shipping invoice’ from the seller. HMRC have a valuation branch which can check vehicle values if they look suspiciously low so don’t be tempted. If you’re having your motorcycle delivered, make sure you’ll be there to receive it in person (and therefore able to check it upon delivery) and that the delivery driver is able to unload it to where you want it. You’ll need to be fairly flexible because shipping companies can’t guarantee when a shipment will arrive and clear customs and won’t want to store it for you unless absolutely necessary. If you do need it stored until you’re ready to receive it, you’re likely to incur some storage charges. If there is any damage in transit you’ll need to make this known straightaway and of course if there are any issues with the motorcycle you have bought you’ll need to take these up with the seller at the same time. Now is the time to dust off the DVLA ‘used vehicle import pack’ that you ordered previously. This will guide you through the various steps towards registration which begin with notifying HM Revenue and Customs (HMRC) and the subsequent NOVA (Notification of Vehicle Arrival) application. In summary, when your motorcycle arrives, you (or your agent) have 14 days to notify HMRC – you can be fined £5 for every day you’re late telling them. HMRC will then make a NOVA application on your behalf and you’ll receive a NOVA letter by post, usually within a couple of weeks, which will detail how much VAT and duty you will need to pay. The NOVA letter is what eventually needs to be sent to the DVLA to begin the vehicle’s registration but this can’t take place until you have actually paid any import duties and taxes that are due. The rates you’re charged (and how you pay) depend on the type of vehicle and where you imported it from. You can always call the HMRC helpline to check rates if you are in doubt. Import duty is 8% for motorcycles with an engine size of below 250cc, and 6% for engine sizes larger than this. Tax is charged on the declared value at the prevailing VAT rate – however, if the motorcycle is a classic (i.e. over 30 years old) and meets certain requirements then normally, import duty is waived and VAT is lowered to 5%. The DVLA pack will contain information about what documents you’ll need to initiate the registration process. One of these is a current MOT certificate (unless your bike is exempt due to its age, etc.) so if your motorcycle is going to need work or restoration, you won’t be able to register it until it is roadworthy. Talking of MOTs, don’t forget that, depending on the origin of your imported motorcycle, you may need to convert speedometers to show mph and modify headlights so that they dip correctly. This is because it is your responsibility, as the importer, to ensure that the motorcycle meets the relevant EU standards and approvals. For example, if the bike is 20 years old it must meet the requirements that were in place 20 years ago (there weren’t many, so most older bikes are absolutely fine). To obtain the important age related registration mark, DVLA will need proof of the age of your motorcycle. If you have the original non-UK motorcycle logbook, you can submit this but they won’t return it. If you want to keep the original logbook, you should therefore obtain and submit a dating certificate instead. These can normally be obtained from the relevant UK manufacturer/importer. Some Clubs like the Vintage Japanese Motorcycle Club (VJMC) are also able to offer this service. You don’t need evidence of insurance to register your motorcycle unless you live in Northern Ireland (or to be more accurate, unless you want to register your motorcycle to an address in NI). This creates a catch 22 situation because an insurer normally won’t insure a motorcycle without a registration mark. However, personal imports are becoming more common so your friendly insurer should be able to temporarily insure it by frame and engine number. 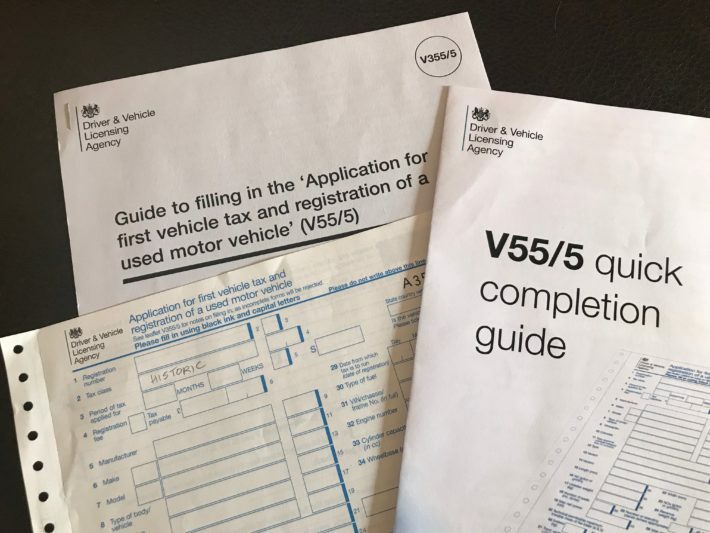 When you have got everything ready (it tells you in the pack exactly what you need to send), send off the V55/5 registration form, dating certificate or original logbook, MOT certificate, evidence of your name and address plus the applicable fees (for VED if applicable and first registration) and DVLA will then issue a registration certificate and a notice of the age related registration mark. This can take up to 6 weeks. Once you have confirmation of the registration mark you can get a number plate made which can be quite gratifying! 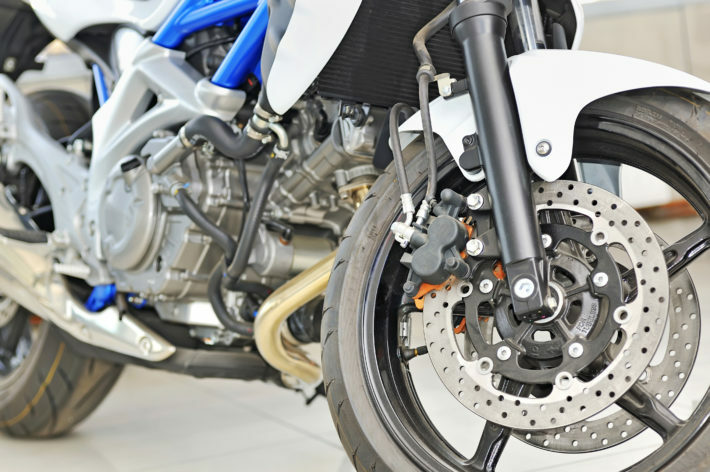 Like any motorcycle, you’ll need insurance before venturing on the road so be ready to provide your insurer with all the relevant details about the bike and its origins. Generally, for common models, insurance rates will be similar to those for similar ‘officially’ imported bikes. As always, if you’re in any doubt, just give your insurer a call. It’s always good to be able liaise and meet with other like-minded owners, especially if your motorcycle is rare in the UK. Depending on the make and model motorcycle that you have imported, there may be specialist owner groups/clubs you can join, such as the VJMC. To find out about meetings, events and owners clubs, magazines like Classic Motorcycle Mechanics are a great source of not just information, but also inspiration. Before you know it, you could be looking to import another one! If you enjoyed that we’re sure you’ll love our guide to new vs used bikes!